This grilled Rosemary Tri-Tip Roast is perfectly tender. The marinade gives the tri-tip so much flavor, there is no need for steak sauce. What is a Tri-Tip Roast? A tri-tip roast is a lean and tender cut of beef from the bottom sirloin of a steer. It has a triangular shape, which is where it gets it’s name. The same cut can also be called bottom sirloin roast or triangle roast. It is a small roast usually weighing 1 1/2 to 2 pounds. 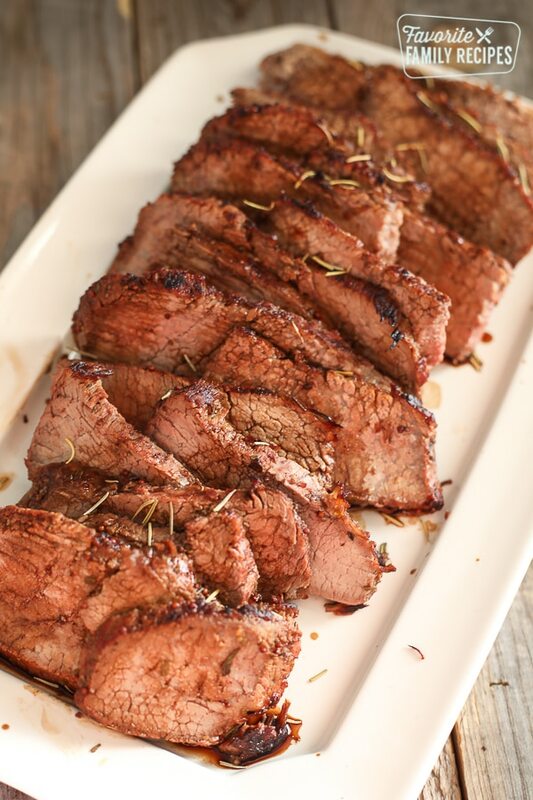 Tri-tip is a versatile cut of beef with great flavor. Rubs, seasonings, and marinades all enhance the tenderness and the flavor of the roast. A tri-tip roast is delicious roasted or broiled in the oven, or cooked on the grill as in this recipe. The grill gives the roast an extra smoky flavor and slightly crispy exterior while keeping the inside tender and juicy. Notice the shape of the tri-tip. It is shaped kind of like a boomerang. Close to the center of the cut, or the boomerang shape, there is a seam of fat. On each side of the seam, the grain of the meat runs a different direction. The “grain” is the direction that the muscle fibers run. It looks like lines or stripes in the meat. The first cut of the tri-tip should be along the seam at the center of the meat. This is the point where you can see that the grain of the meat goes one direction on one side, and another direction on the other side. Look at both halves and determine which way the grain is going. Slice the meat in thin slices that go against (across or perpendicular to) the grain. Slicing meat against the grain cuts through the muscle fibers and makes the meat more tender and easier to chew. Layer the slices on a serving platter. 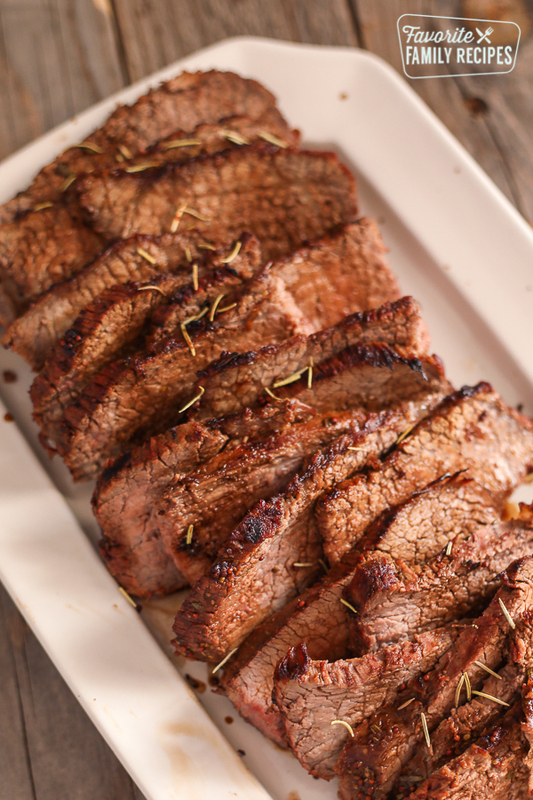 This grilled Rosemary Tri-Tip is perfectly tender. The marinade gives the tri-tip so much flavor, there is no need for steak sauce. *Please note that the roast will need to marinade 6 to 12 hours before grilling. In a small bowl whisk together marinade ingredients. Spread the marinade on the roast, cover with plastic wrap and refrigerate 6-12 hours. Allow roast to stand at room temp for 20 minutes before grilling. Lightly season both sides of the roast with salt. Sear over direct medium heat for about 10 minutes turning once halfway through searing time. Continue grilling over indirect medium heat for 20-30 minutes longer. Remove from grill and allow to rest for 5 minutes. Cut across the grain into thin slices. Serve warm. *Prep and cooking time does not include the 6 to 12 hours the roast will need to marinate in the refrigerator. There are so many great recipes and options when it comes to cooking a roast. If you have an Instant Pot, try our Instant Pot Sunday Pot Roast or our Instant Pot Beef Goulash. For a delicious slow cooker roast, try our Slow Cooker Roast Beef and Vegetables or our Crock Pot Mexican Shredded Beef. Oh man! This looks so good. Thanks for sharing. Tri tip is the BEST! My mouth is watering…. This looks incredibly delicious. My husband would do flips for this. Sounds fantastic with rosemary!! What is whole grain mustard? Mustard seeds or a type of liquid mustard? Could you brown this on top of stove and finish in oven? You could try, we have only made it on the grill so I’m not sure how it would turn out.